Shining Path, by William Schnorbach. Aristos Press. 295-page hardcover $29.95. 346-page trade paperback $17.00. Billed as “A Lone Wolf Thriller – Book One,” book is a piece of novelistic history that sets several fascinating characters against the turmoil in Peru born of corrupt government and a brutal revolutionary force named “Shining Path” by its founder, Manuel Ruben Abimael Guzman Reynosa (usually reduced to Abimael Guzman). He considered himself to be the fourth sword of Marxism, inspired by the Maoist third sword (following Marx and Lenin). Mr. Schnorbach focuses his narrative on four months toward the end of a twelve-year nightmare of violence for the Peruvian people. The principal characters are U. S. Congresswoman Marta Stone, who plans to grab a Senate seat in a forthcoming election; a Native American undercover CIA operative and “sky walker” who uses the moniker Lone Wolf, super-skilled and dangerous; and Antonio Navarro, co-founder of Shining Path who knows the movement has lost its moral compass. The three form an alliance of necessity in a world in which loyalty is bought and sold. After Marta is abducted in Lima and held as a prisoner of war, Lone Wolf (whose legal name is Josh Barnes) is assigned to rescue her. Antonio (hereafter “Tony”), also imprisoned, is protecting her. The novel proceeds by rolling out an unhappy mix of action and exposition. The action scenes are stunning whirlwinds of sensory experience. Over and over, Lone Wolf’s special martial skills, offensive and defensive, are on display along with other brands of physical prowess and mental acumen. He is a great planner as well as a great improvisor. He knows how to beat the odds when his team is overmatched. He, along with Marta and Tony, must make their way through difficult terrain with insufficient nourishment and a determined, well-trained enemy. They deal with injuries and exhaustion. Mr. Schnorbach handles this action scenes with great skill, offering vivid descriptions of the rugged environment and building pulse-racing tension from episode to episode. . . . Choice of Enemies, by M. A. Richards. Sunbury Press. 224 pages. Hardcover $24.95. Trade paperback $16.95. Billed the first Nathan Monsarrat Thriller, “Choice of Enemies” introduces Nathan working as an academic dean at a Greylock College in Western Massachusetts. Actually, the novel opens a couple of years earlier, with the narrator detailing the last chapter in Nathan’s career as a CIA deep cover operative. We see a confused tableau in which Nathan is rescued after many months of incarceration and torture in Africa at the hands of a Nigerian rebel group named FATA. His rescuer, who is also his CIA superior, is a man of many identities. One of those identities is as Felix Sanhedrin, a cruel egocentric with expensive tastes, a warped sense of fashion, and no loyalties. Nathan had been caught up in the battle to control African oil, the goal of a consortium of American oil companies in league with the CIA. African national leaders, who may just as well be called African criminal gang bosses, have other ideas – as do the rebels seeking to overthrow them. Nathan is still not done making the transition to his new bucolic life in Berkshire territory when Sanhedrin shows up with an assignment that has the additional benefit of allowing Nathan to settle scores and perhaps rescue a woman very dear to him. The assignment has to do with the transfer of a rare terracotta statue, but that mission soon leads to others, including an assassination that leaves Nathan rather gleeful. The author has a penchant for Jewish references, including choosing a setting in Namibia that has the same name as a town in Israel – Rosh Pinah. Mr. Richards even finds room for a minor character called the “yeshiva bocher” (an Orthodox Jewish schoolboy), now switching from Hebrew to Yiddish for his Jewish-toned running in-joke. Threat and suspicion are everywhere in Nathan’s world, and he himself is the cause of it in worlds that he enters. Thus, suspense is everywhere, too. Mr. Richards is already a master at manipulating his readers and raising the suspense thermometer to higher and higher levels. Nathan Monsarrat’s stony deliberateness is part of the process. Will all of his careful planning produce its intended end result? Or will things go wrong? . . . Passenger 19, by Ward Larsen. Oceanview Publishing. 336 pages. Hardcover $26.95. Mr. Larsen’s latest is now labeled as “A Jammer Davis Thriller,” linking it with two of the author’s previous novels. I, for one, am happy to approve the plan. I’m just thrilled to imagine more such techno-thrillers. In this one, not only is Jammer assigned to investigate a plane crash, he is also out to save his daughter Jen. She was on that flight but not accounted for after the crash, nor is another college girl, Kristin Stewart, with whom she had boarded the plane. The investigation, performed officially by Colombian authorities with Jammer constantly overstepping his role in the matter, reveals that the crash was not survivable. It also reveals that the pilot and co-pilot were shot before the crash, along with one other person who turns out to be a Secret Service agent. Figuring out the who, the how, and the why of this off-the-charts event takes Jammer and others on a dangerous journey. The examination of physical evidence and the exploration of countless “what ifs” leads to an unusual theory: the plane must have landed and taken off again – and not because of an emergency, but rather according to plan. “Passenger 19” is not only a study in detection, it’s also a study in Colombia, its capital Bogotá, and the dense rain forests. In a country in which mob crime is among the largest businesses, those who wear official uniforms and hold government positions may or may not be trustworthy. Those who wear the uniforms or emblems of various paramilitary forces are likely to be private entrepreneurs who can be trusted to run illegal enterprises. The biggest, of course, are the drug cartels. Gaining ground are those in the kidnap-for-ransom business. When it’s discovered that one of the dead men in a pilot’s uniform is not the pilot who had handled the original take-off (the uniform is too big), Jammer concludes that the first set-down of the plane was part of a hijacking. The later wreck would have been designed to get rid of witnesses. Eventually, Jammer’s grudging Colombian counterpart, a military officer who oversees air transportation issues, is found murdered. Looks like he was getting too close to something. The plot – with all of its carefully managed twists and turns of information, deduction, and action – keeps the pages flying. Even more impressive is Mr. Larsen’s handling of the technical material: the intricacies of aircraft design, handling characteristics, and controls. As Jammer and others discuss these matters, examine the tortured parts of the downed plane, and explore the crash landing’s impact on the terrain, readers are brought close to the analytical, scientific mind making its way through a myriad of facts to reach conclusions and determine actions. . . .
Atria Books. 384 pp. $27.00. This taut page-turner captures the contradictions and complexities of the post-WWII German capital. In his latest fast-paced thriller, Leaving Berlin, Joseph Kanon explores an exciting, fear-filled time. The constant drone of airlifts bringing scarce supplies to the isolated city devastated by World War II is the background music for beleaguered lives. The experiment of a Soviet Germany in which one authoritarian regime supplants another has everyone looking over his or her shoulder. Old loyalties — and old identities — give way to new or faked ones.Kanon’s central figure is Jewish writer Alex Meier, who, as a young man with a blooming reputation, had left Germany for the United States ahead of the war. Now, in 1949, he returns under complex circumstances.Meier has made a bargain with the devil. The House Un-American Activities Committee (“McCarthy”) threatened to deport him, an uncooperative German socialist, making his return impossible and his separation from his young son permanent. However, Alex reached a deal with the newly established CIA to provide information in exchange for a return to the U.S. A native Berliner with many connections, he is at once at home and in exile. Everything is changing as communist rule reshapes the culture. 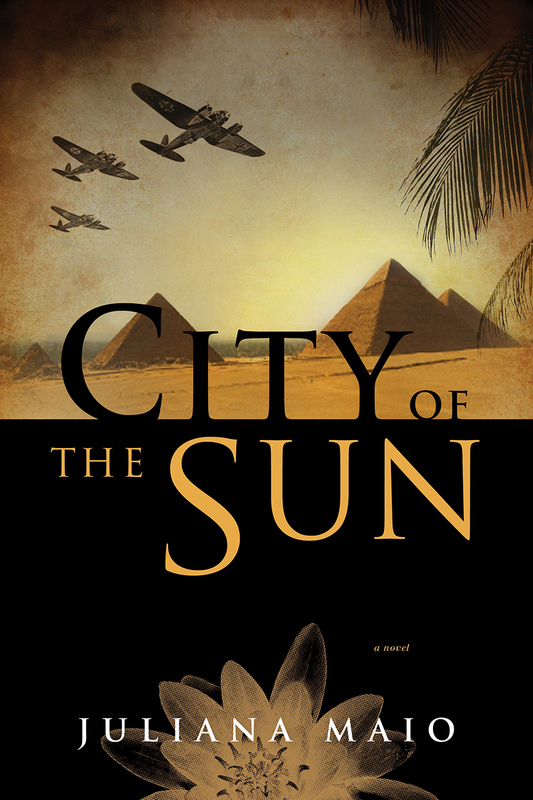 Something of a celebrity, Alex mixes with such returned notables as Bertolt Brecht while finding his assignment as a CIA agent upsetting to his moral compass. . . .
City of the Sun, by Juliana Maio. Greenleaf Book Group Press. 380 pages. Hardcover $24.95, trade paperback $15.95. When Mickey Connolly, a young American journalist comes to the Middle East to report on the desert war, he is astonished to discover Libyans praising Hitler’s Third Reich and seeing their future as Nazi Germany’s allies. In Cairo, his “home” base, he encounters much of the same attitude, though it’s essentially more anti-English than pro-German. Egyptians had lived under British martial law since 1939, compromising the independence gained in 1936. With Rommel furiously approaching the Egyptian border, Connolly wants to wake up American readers to the facts and significance of this desert war theater. For much of the 1941-2 the time of the novel, the Germans seem unstoppable. So why are Jewish refugees from Germany and elsewhere coming to Egypt in their flight from persecution? There is a sizeable, well-established Jewish community there with mature institutions. There are Jewish individuals in positions of influence and power. However, the stability of Jewish life in Egypt and elsewhere in the Middle East is threatened by the dramatic rise of the Muslim Brotherhood and its growing partnership with Nazi Germany. Meet Heinrich Kesner. He works for the Abwehr, the German military intelligence operation reporting on doings in Cairo, allied military strength, and whatever will prepare for Rommel’s victory in Egypt. He has cultivated a wide range of informants and is now being noticed by the SS as a useful functionary. He has the particular assignment of tracking a Jewish refugee who is has arrived via Istanbul. That refugee is Erik Blumenthal, who with his father Viktor and his sister Maya is stay with the Levin family, cousins who will shelter them until their final papers allow for transit to Palestine. They have just barely escaped from Germany. The host family is headed by Joe and Allegra. Their oldest child, Lili, who is in her late teens, befriends Maya, who is somewhat older, and after a while the two are sister-like confidants. Both young women are knockouts. We find out later that Allegra’s brother is a prominent lawyer who is assisting Zionist efforts. Mickey Connolly has been gaining access to personnel at the British and U. S. embassies, visiting Jewish leaders and institutions, and reshaping his reportorial focus, narrowing it down to the situation of the Jewish community in Egypt and the Arab Middle East. Mickey proves a good sleuth, and he is recruited by the U. S. embassy to secretly hunt down the very same Erik Blumenthal who is Kesner’s target. Erik is important because of his stature as a young nuclear scientist who has the kind of expertise that can benefit either the Allied or Axis powers. When Mickey encounters and falls for the reserved, intelligent, and extremely attractive Maya, he has no idea that she is the sister of the man he seeks. Maya – properly fearful, guarded, and yet enchanted to be in “Paris on the Nile” – hides her true identity and whereabouts. Intermediaries help them communicate, and soon enough their torrid love affair begins to overwhelm the political thriller plot, though the two stories are of course interwoven. Each lover has secrets, creating a clash between trust and passion. Juliana Maio winds her story-telling through alternating points of view, weaving a pattern in which readers stand behind Connolly, Kesner, Maya, and others. The device of Interrupting one character’s thread with another leaves readers hanging, especially as events draw the characters closer and closer together. A sizeable cast of well-etched minor characters populates a fascinating landscape at a fascinating time in history. Egyptian born Maio’s lavishly painted setting is one of her novel’s many charms. She takes us to a Cairo still intoxicated by the long cultural aftermath of Napoleon’s conquest and occupation at the turn of the nineteenth century. Pockets of Cairo, including the suburb of Heliopolis (City of the Sun), became effectively Europeanized, and French language, arts, and manners became part of the city’s look and social tone up to and well beyond the onset of World War II. Knowing that the Nazis did not conquer Egypt, we are left to anticipate the fates of Erik, Mickey, and Maya. My lips are sealed. This review appears in the April 2014 issues of Federation Star (Jewish Federation of Collier County), L’Chayim (Jewish Federation of Lee and Charlotte Counties), and The Jewish News (Jewish Federation of Sarasota / Manatee).